If you follow me on tumblr this will look familiar – since I started Workspace Wednesdays over there a month ago. I’d like to make it clear that this will not become a weekly thing on wordpress, but it may become monthly. I wanted to start doing these since i’ve always enjoyed reading blog posts about other peoples workshops. 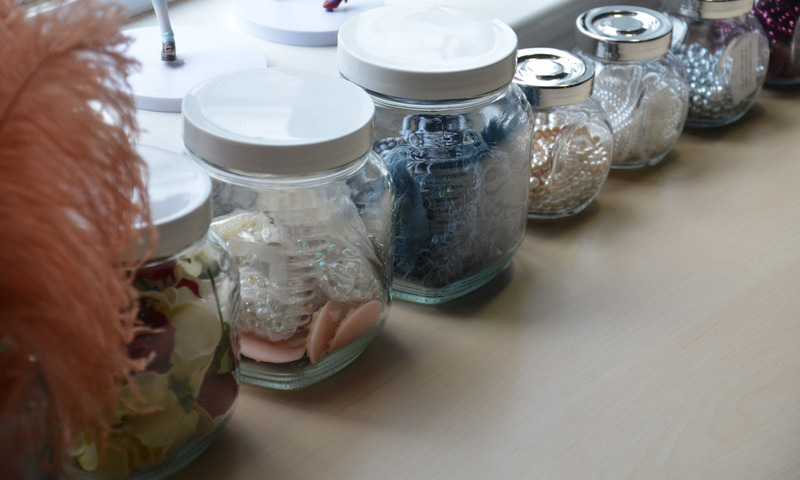 I find it interesting seeing the space people sew in, and I think you can learn a lot about a person from the way they organize their things. Sometimes you can find great ideas for your own space, or even get a bit of cleaning inspiration that makes you tidy things up. Since I enjoy reading them so much, I decided to write about my own! Each post will cover something different, this one is notions, but in the future I will have a post about how I store fabric, works in progress, completed costumes, and maybe a post devoted to my sewing machine or ironing station. I’m also totally open to suggestions if there is anything you would like to see! I sort my notions into two main categories. The first are practical notions, which are notions that help in the construction or actual sewing of a garment . Things like bobbins, hem clips, grommets, needles, pins, buttons, zippers, boning, etc. would all fit in this category. 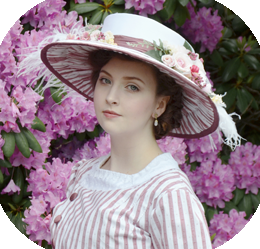 The second are decorative notions, which are exactly what you would expect, notions that decorate the garment. Rhinestones, beads, lace, trim, fringe, feathers, and so on. 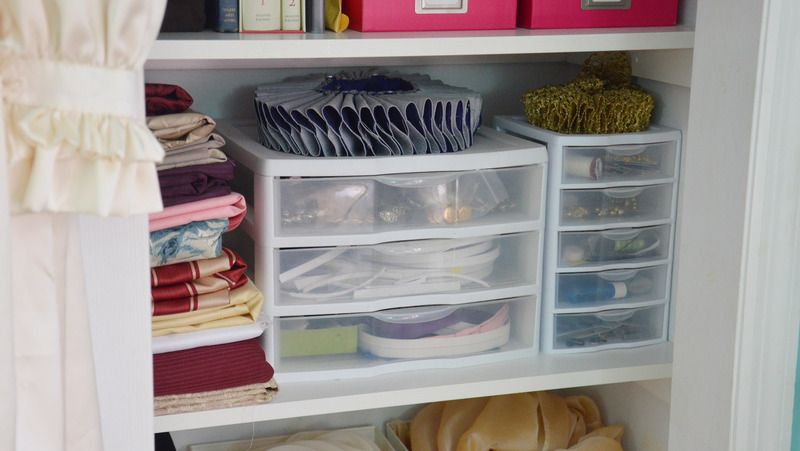 I store almost all of my practical notions in these plastic drawer units, which sit on a shelf in my closet. They aren’t the prettiest things in the world, but they are really practical and the perfect size. I will start off with the three drawer unit. The top drawer stores buttons! I keep them sorted by shank and non shank. I tend to buy these online, or in large quantities, so most of them come with bags, which I use to keep them relatively organized. 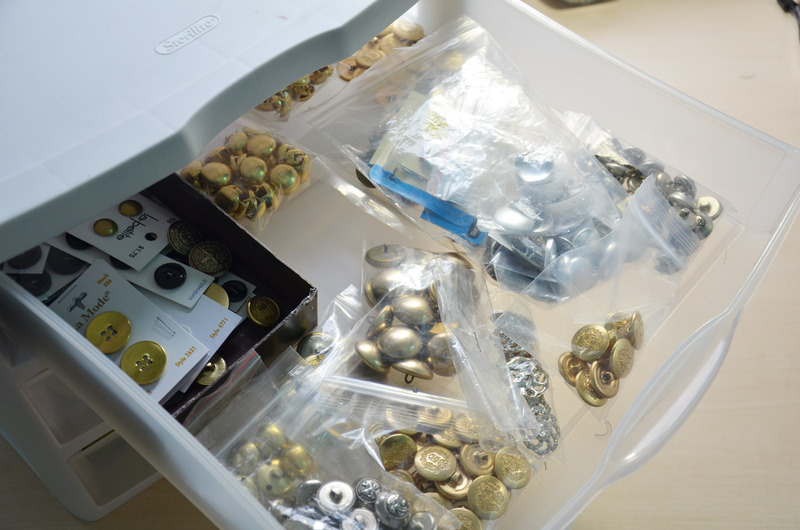 The small brown box has all my non-shank buttons, or buttons I have small quantities of (two or less). The box used to store chocolates, and despite it being clean the entire drawer smells delicious because of it. Below that I have my boning drawer. This one is a bit of a mess, but I don’t lose sleep over it since I don’t think there is any way to nicely store boning. I have several rolls of hooping wire, a bit of rigilene, some spiral steel, and some regular plastic boning. I also store a file in here (which can be used to soften the edges of plastic boning), and some twill tape. The final drawer has zippers and bias tape in it. I think it’s pretty self explanatory! Now moving on to the smaller, five drawer unit. The top drawer mostly stores hand sewing supplies but has some random things in it too. 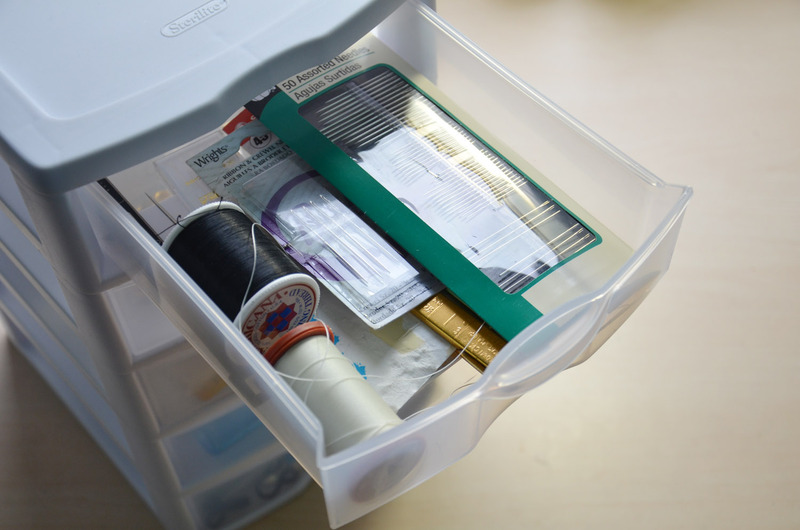 I have needles, heavy duty thread (which won’t work in a machine), hem clips, and seam rippers stored there. I also tend to store my pin box here when it’s not in use. After that there are grommets. 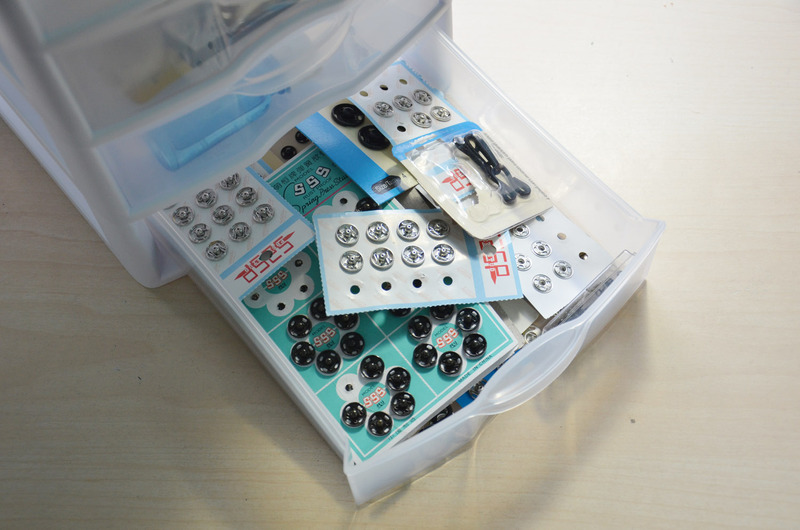 I store all the small, single part eyelets in an old pin box, along with the tools to set them. The rest are stored in bags or the original packaging. My set of grommet pliers usually lay on top, but they were in use at the time I took this picture. The next drawer has elastic, velcro, and a few random things (like gel bra straps) inside of it. 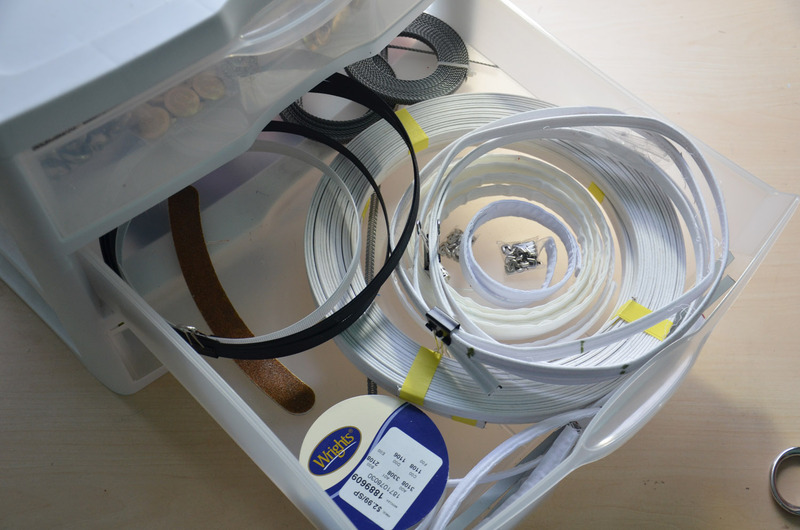 It’s really rare for me to need anything from this drawer – most of my projects don’t require elastic. Below that I have a kind of “Random” drawer. I mostly store buckles and suspender clips in here – two things I have never used in any of my projects ever, so i’m not sure why I have so many. I also have fray check, and some clear nail polish in there. The last drawer has snaps and hooks in it (but mostly snaps). I love how buttons look, but I tend to prefer snap closures since they are so much faster to sew on, and easier to open and close when you are getting a garment on. Because of this I have somehow collected hundreds of them in various sizes and colors. And that’s it for the little drawer units….but that isn’t the last of my notions! 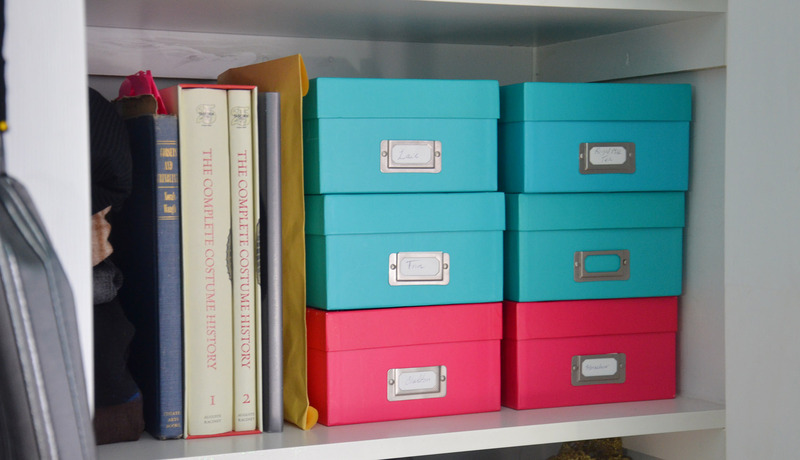 I also have two tupperwear containers that usually sit in the top drawer of a unit underneath my desk. One holds soft measuring tapes, and the other has all my machine related goodies. 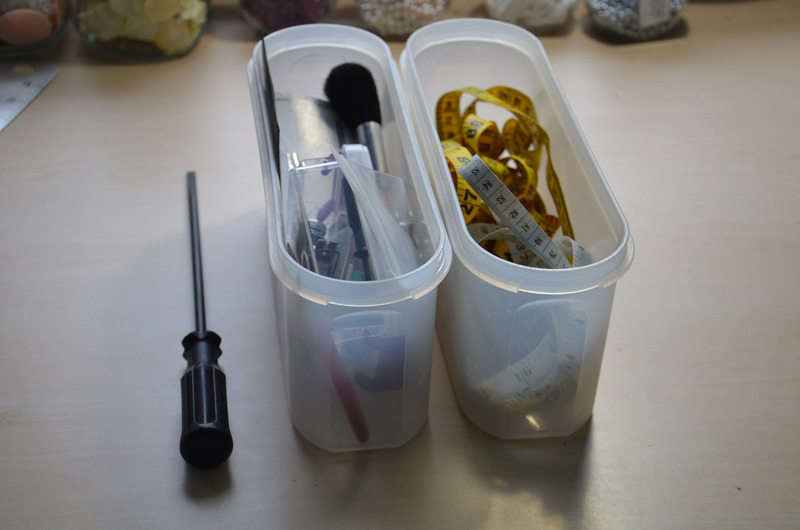 I’ve found this is the most convenient way of storing measuring tapes – the container is open top so they are easy to grab, and even easier to put away. The container is large enough that I don’t have to cram them in there, and they don’t struggle to get out. 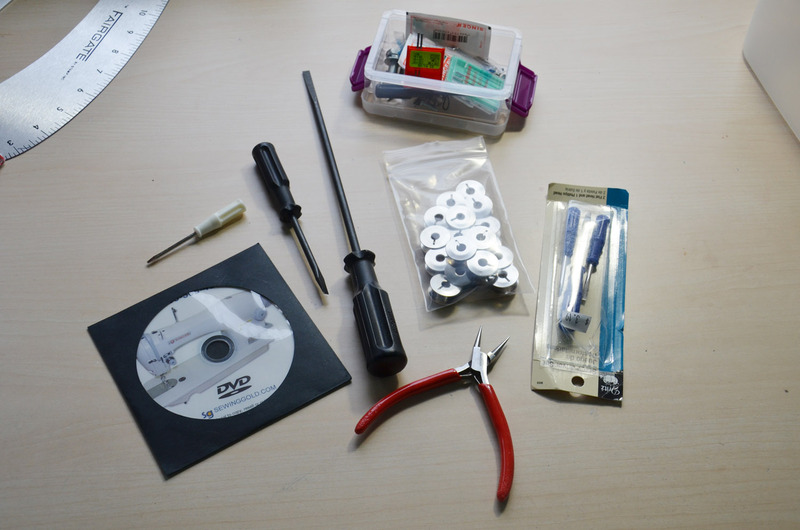 My machine goodies are mostly screw drivers but I also have a DVD that came with my machine, pliers, and extra bobbins. 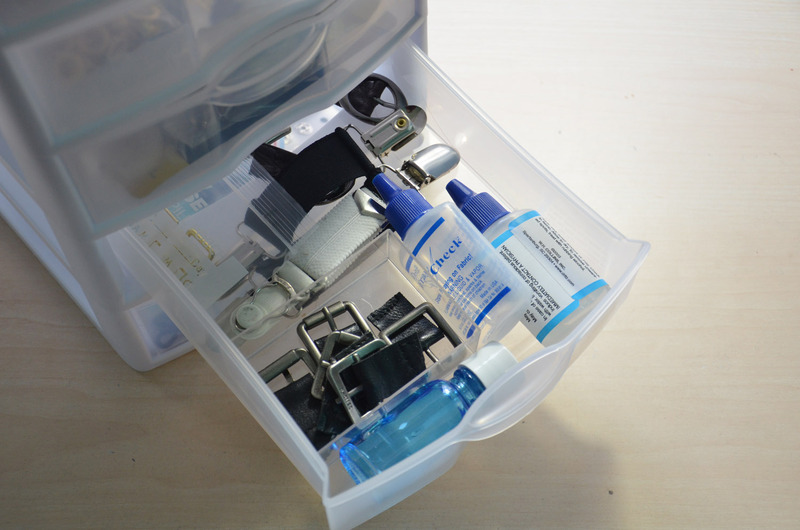 I store my sewing machine feet and needles in a small container I got from michaels. And that is the last of my practical notions – let’s move on to decorative ones! 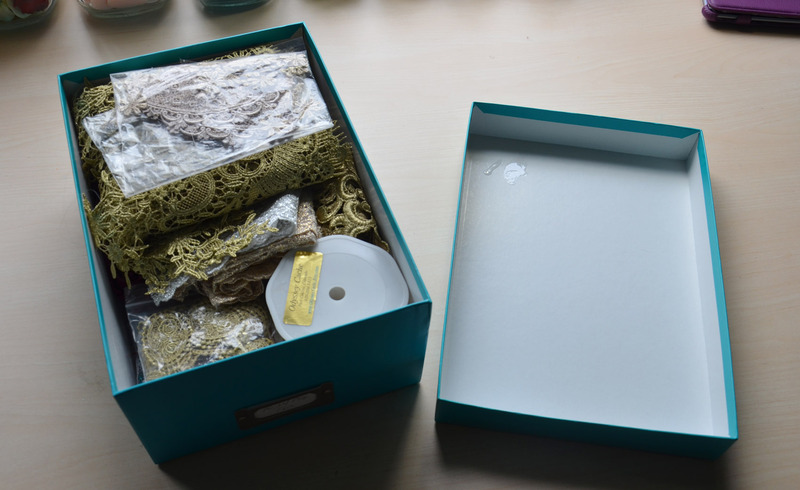 I store most of my notions, and almost all of my trims and lace in brightly colored photo boxes that were purchased from AC Moore a year ago when they were on sale (six for ten dollars). 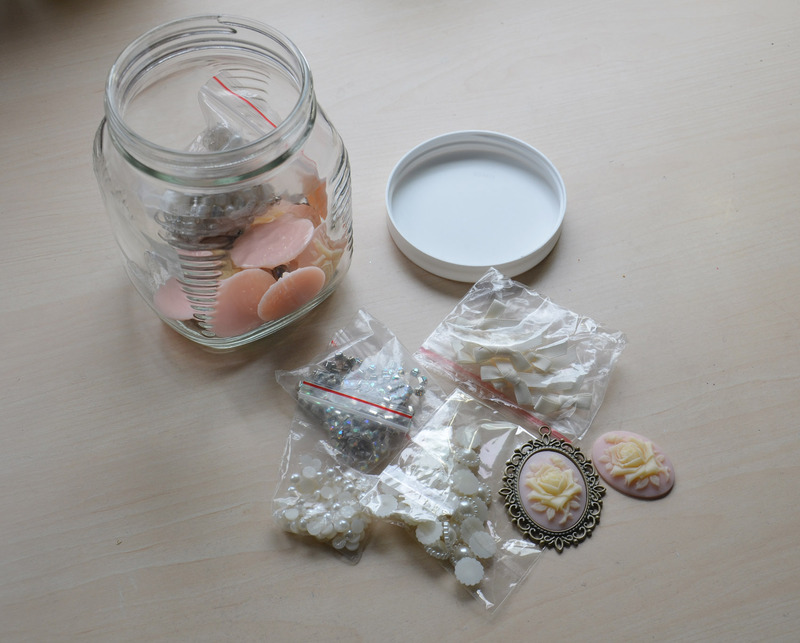 But I also store some items in jars on my desk, and a few other bits are scattered around the studio. I will go over all that – but first the boxes! I’ll start off with the notion-related pink box (the other holds chiffon) which actually belongs with my “practical notions” but fits better here. It’s filled to the brim with horsehair braid. The next box is actually my least favorite, since it’s so messy. 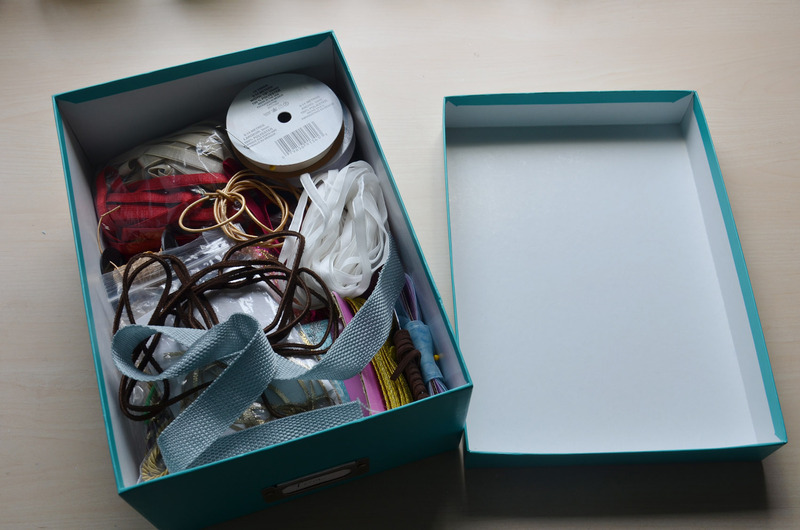 This is my “Random trim” box which has all sorts of things in it – organza ribbon, gold leather cording, elastic satin ribbon, velvet ribbon, braided suede cord, and much more. 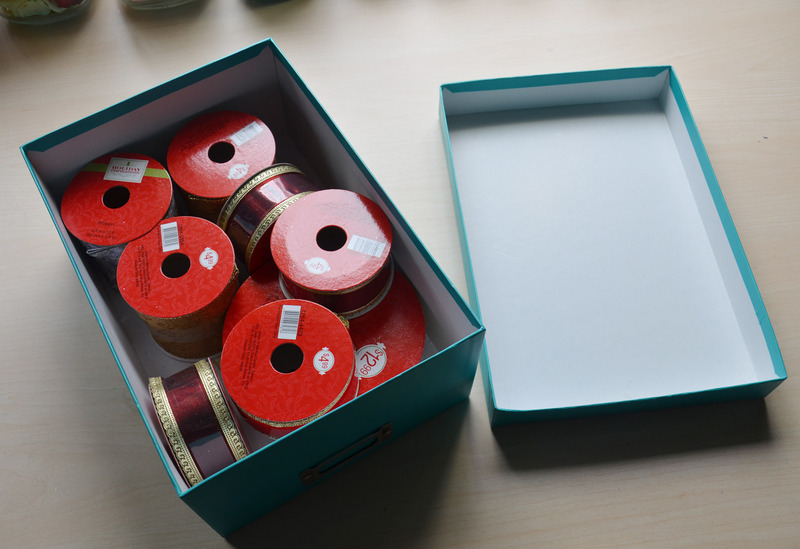 On the flipside – this is my cleanest box, since I only store unopened, spooled ribbon in here. These were all purchased quite recently at joanns when all the Christmas ribbons were on clearance for 80% off plus 20% off your entire purchase. I’m still quite proud of the deal I got on them. 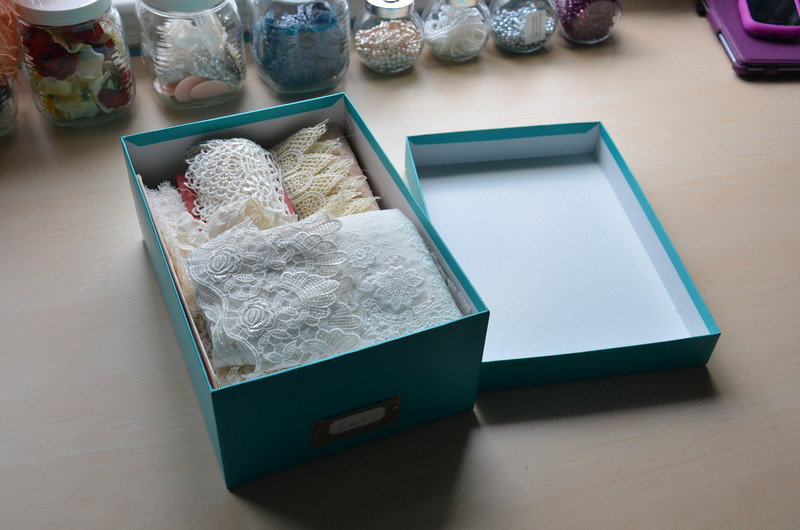 My second favorite box has lace in it! 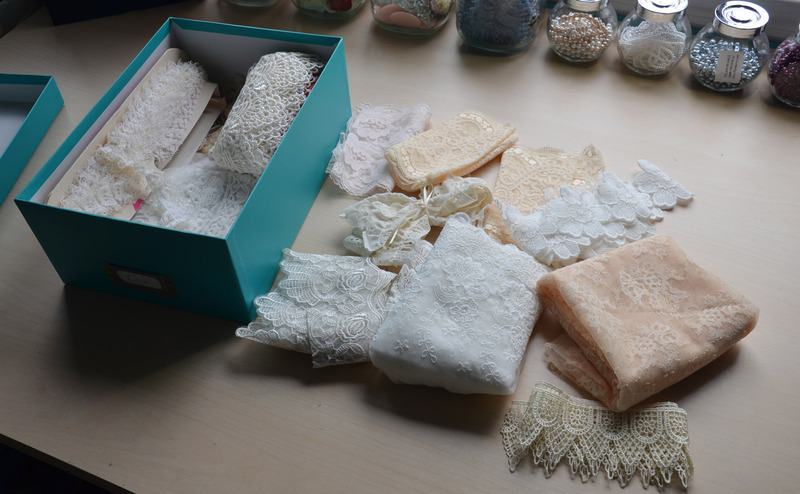 This is my box of natural or lightly colored lace. Most of it was given to me by my grandparents, but a fair amount of it came from etsy. 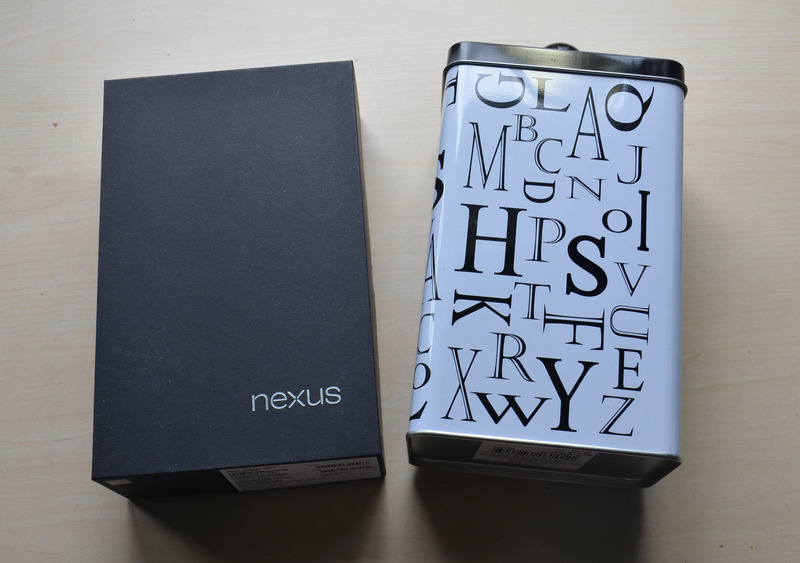 And finally my favorite box! This one has all my colored lace in it, and beneath that it has all my random embellishments. I bought most of these on a whim (20% off sales on etsy will be my downfall, I swear) and I still haven’t found a project to use them on. 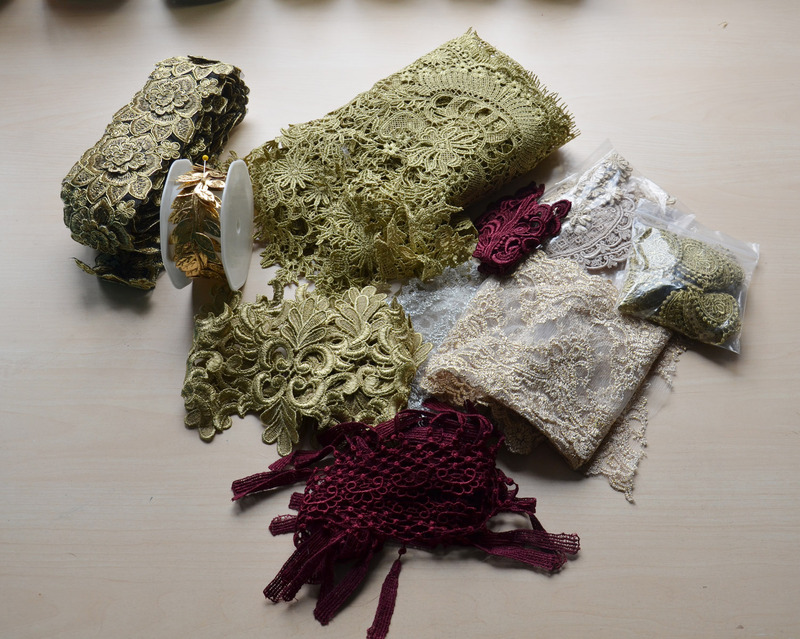 But some day I will make a dress with piles of gold lace and it will be lovely. And underneath all of those, my embellishments! 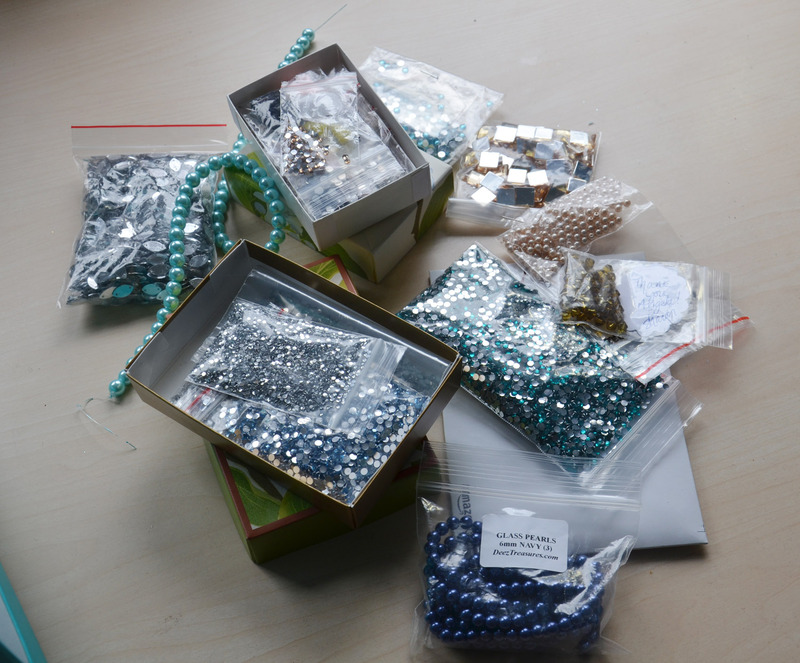 I keep everything sorted in bags, and then most of my rhinestones fit in two chocolate boxes. I’m still not done though – I haven’t even gotten started on the jars. The smaller ones are spice jars which were purchased at ikea, and i’m not sure where the larger ones were bought, but you can get nearly identical ones at ikea. My little jars all store pearls of various colors and sizes. This definitely isn’t the most practical or space saving storage option, but I think they look really cute on my desk, and they double as pattern weights so that’s neat. Large jar number one has feathers in it. This one was missing a lid, so I wasn’t sure what to do with it. 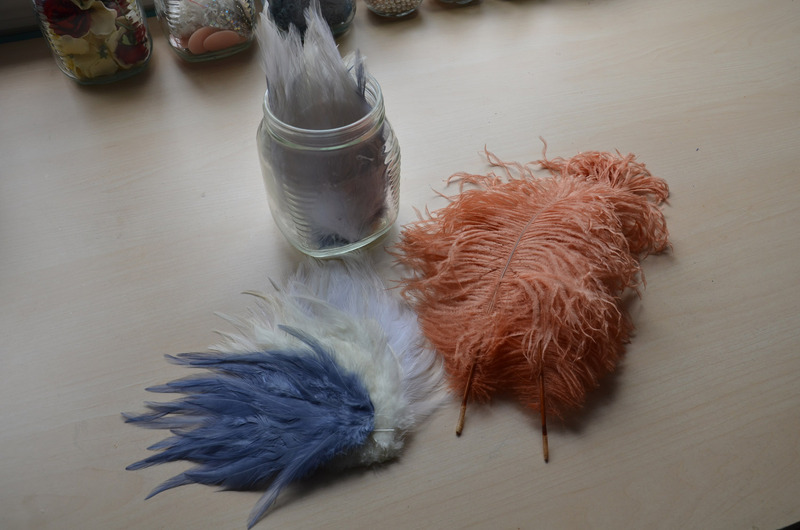 I finally decided that it would make a perfect feather jar, and I think I was right. 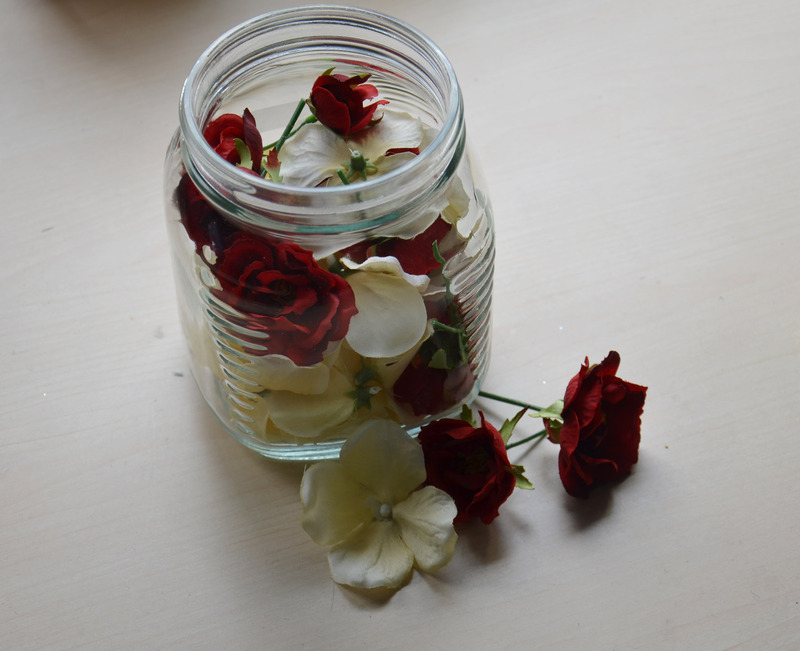 Next to that I have one filled with fake flowers – these were all purchased for a costume that didn’t end up happening. I haven’t found a use for them just yet, but I know I will someday. Next to that I have a jar that holds the leftovers of my Royal Milk Tea costume. Cameos, pre made bows, rhinestone trim, flat backed pearls, and some other stuff. 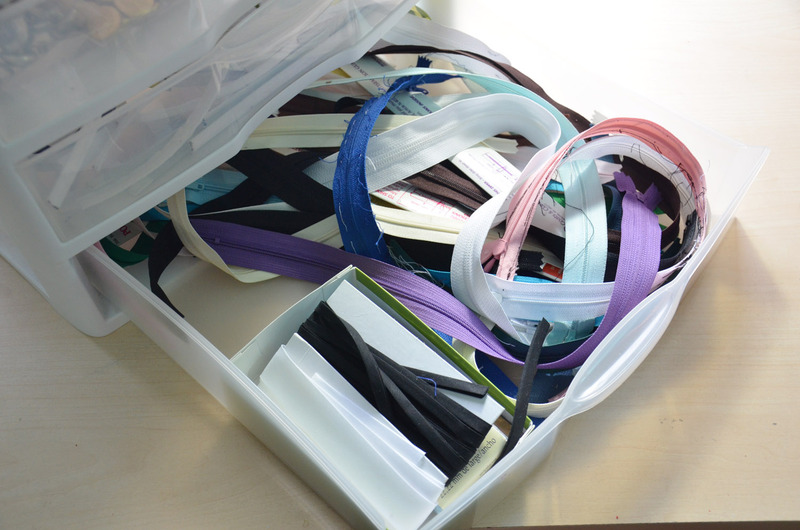 I have such small amounts of the trims in here that they are pretty much impossible to use -but I can’t bring myself to throw them out. 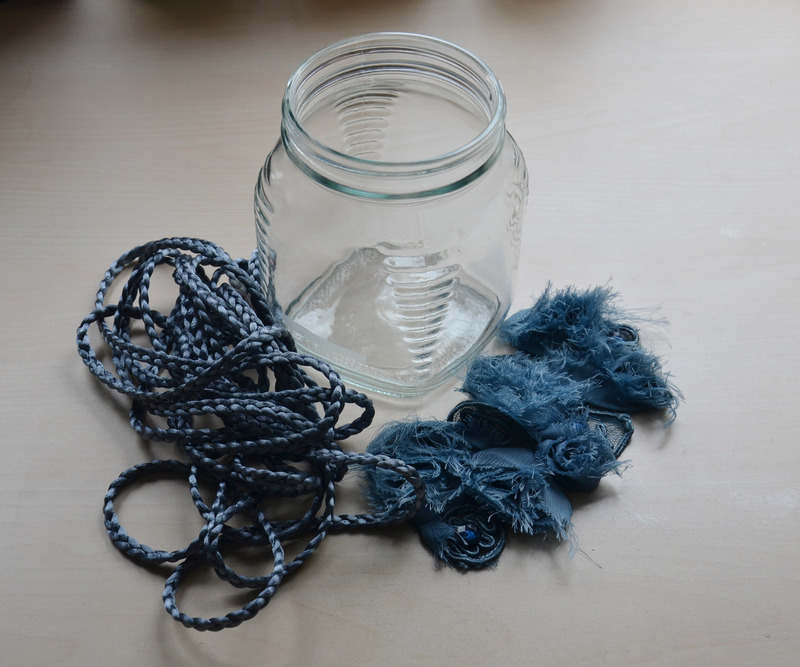 And lastly I have a jar that holds six yards of some blue braided trim, and a matching applique. Once again, these were purchased for a costume that hasn’t happened and probably never will. Also on my desk is a tablet box and a tin canister (also from ikea) both of these hold fake flowers that are leftover from my Christmas Costume flower crown – they are SUPER glittery and that glitter gets everywhere if I open them, so i’ll leave that to your imagination! 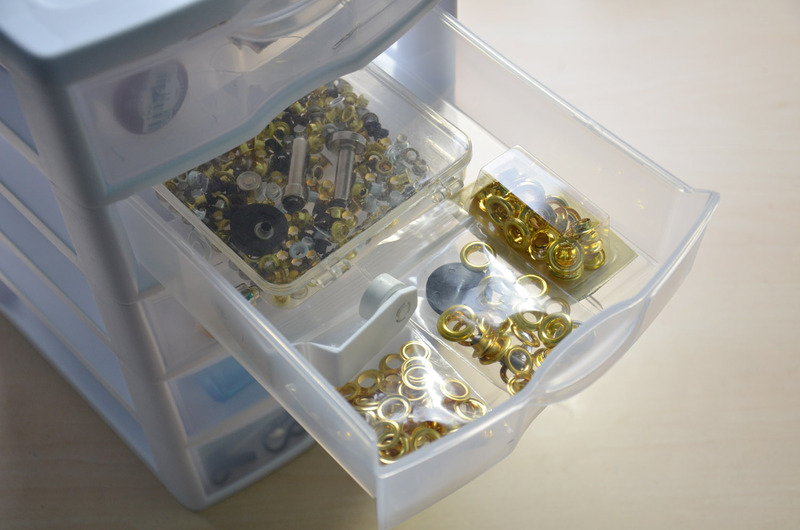 And lastly, here is my beading storage. 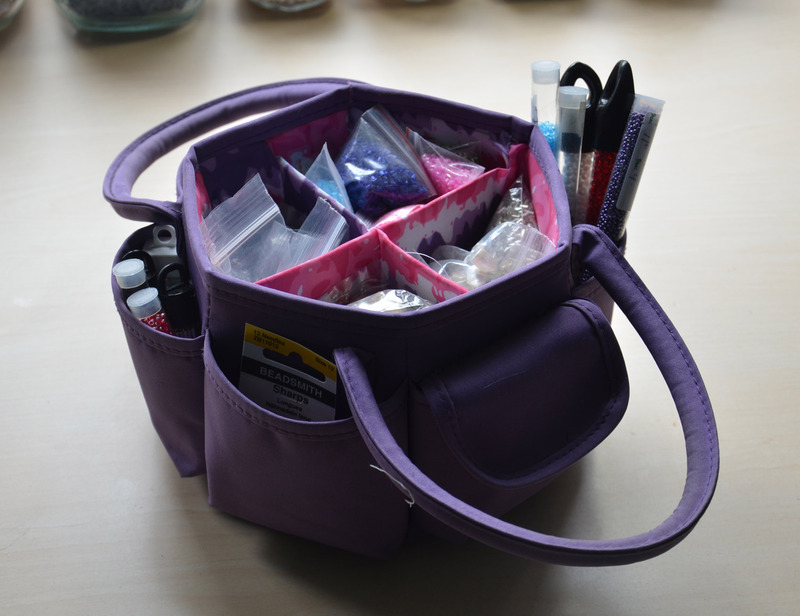 I keep them all in a purple scrapbooking bag I got at michaels many years ago – it’s really convenient, and quite cute (in my opinion) so I like it a lot. 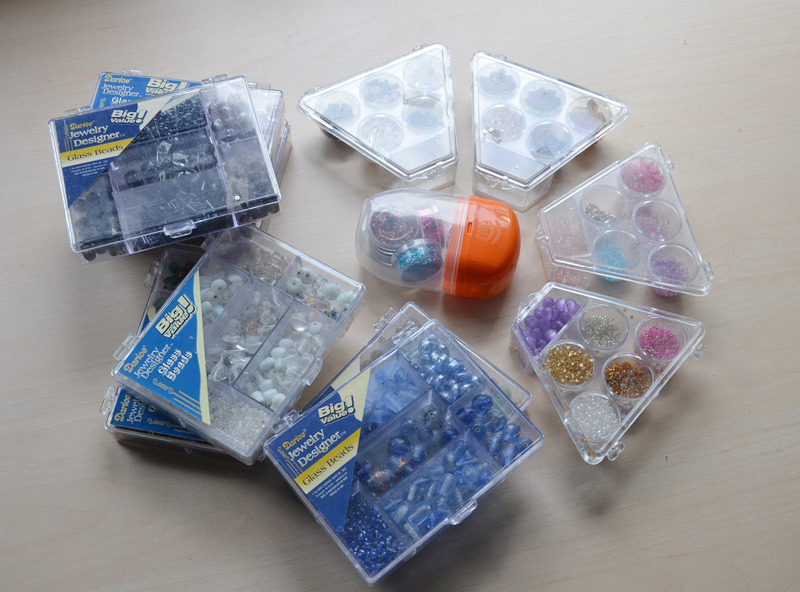 I also have a bunch of these bead sets which I keep stacked on a shelf. On top of them all I have these little pots of glitter, which are stored in a massive tick tack container. So that’s that! 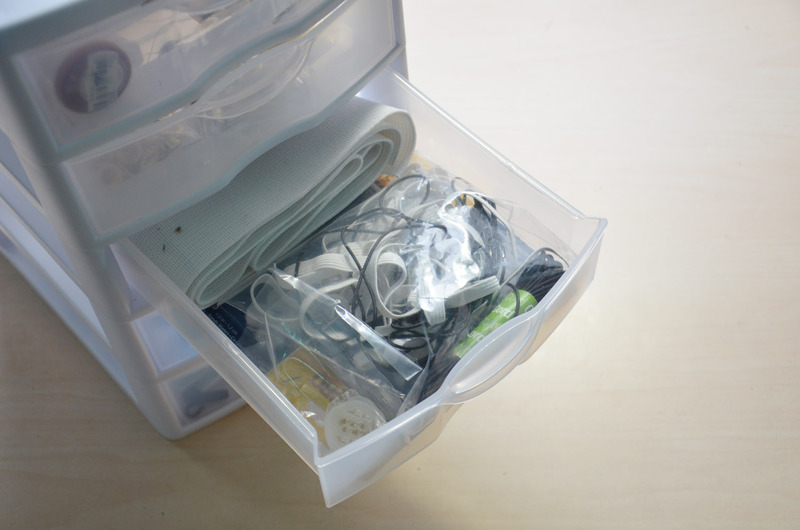 A massive post devoted to notions and how I store them. It’s probably not the most practical system in the world, but it works for me. Do you have any lifechanging, notions related storage tips? I’d love to hear them. Tomorrow I will be back with a more regular “The making of” post. Thanks for reading! pk tu m’envoie des truc??? At least you’re organized, mine kind of just stays in a closet until I need something. I haven’t organized it in years because I’m too afraid that I’ll keep finding things that I bought more of or finding bugs.